Sunflowers, Lilies, Roses, marigolds and petunias, that have an all season floral bloom, have become our muse for this pretty diamond collection. 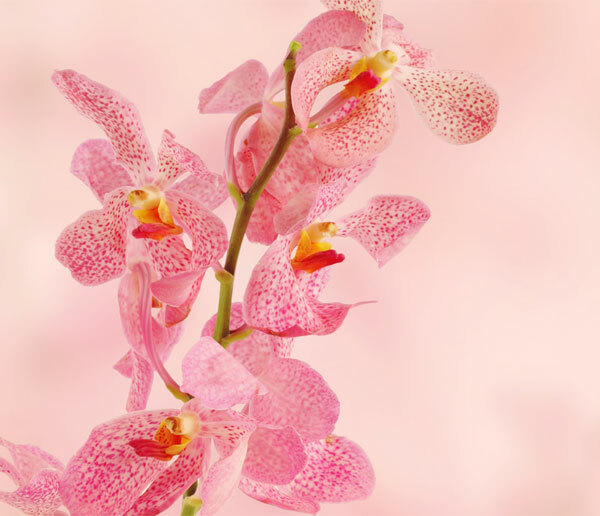 Floral motifs are an ever green design, that you could find everywhere; from fabrics to paintings to jewellery! The full bloom of a hibiscus in diamonds on a bracelet with its flowing trail of pearls to diamond petunias for stud earrings, Manubhai Jewellers brings you the full bouquet of flowers in this diamond jewellery collection. Flowers that you can wear on your wrists, ears, neck and dazzle! 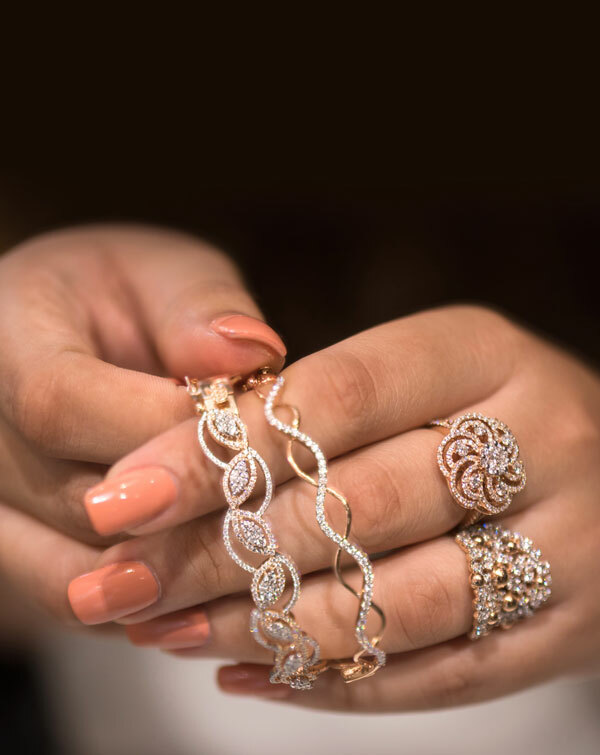 Created in 18K gold with VVS and VS diamond clarity, each of these diamond jewellery pieces are this season’s perfect accessory. Beautiful Diamond and 18k Hallmarked Gold Pendant set. Gorgeous 18k hallmarked gold pendant set has been morphed into a leaf that holds these 2.69 carat round diamonds. With matt yellow gold textures, the design has a blooming diamond studded white gold flower that makes it a breath-taking pendant, paired with beautiful stud earrings. Classic 18K Yellow Gold Diamond Necklace. 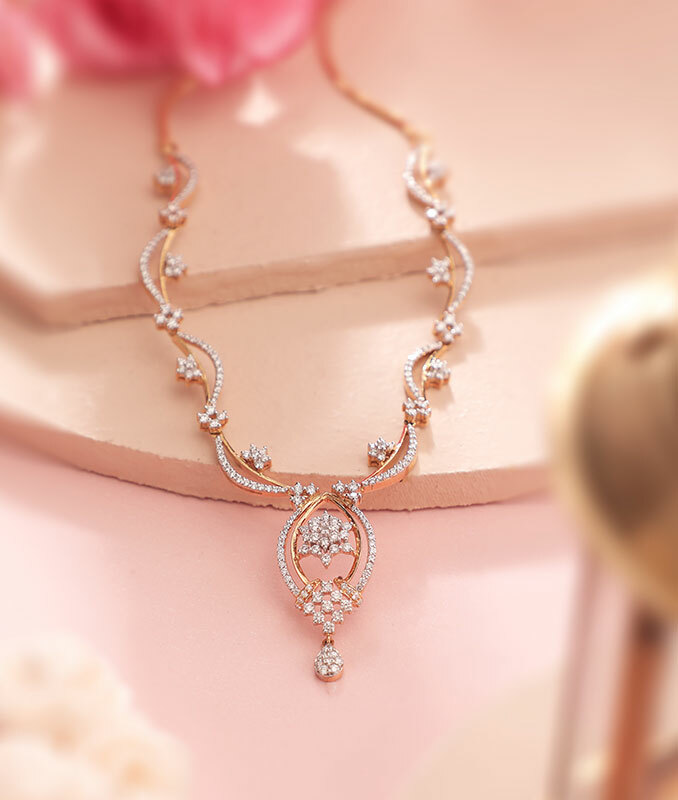 This necklace has golden arcs of 18k yellow gold studded with 3.65 cent round diamonds and laced with pretty flowers of diamonds. With a lovely diamond central pendant that has a petals of diamonds, this necklace is a classic diamond piece! 18k Hallmarked Rose Gold crescents intertwined with dainty 3.19 carat VS GH quality diamonds together form an absolutely prefect diamond necklace set. 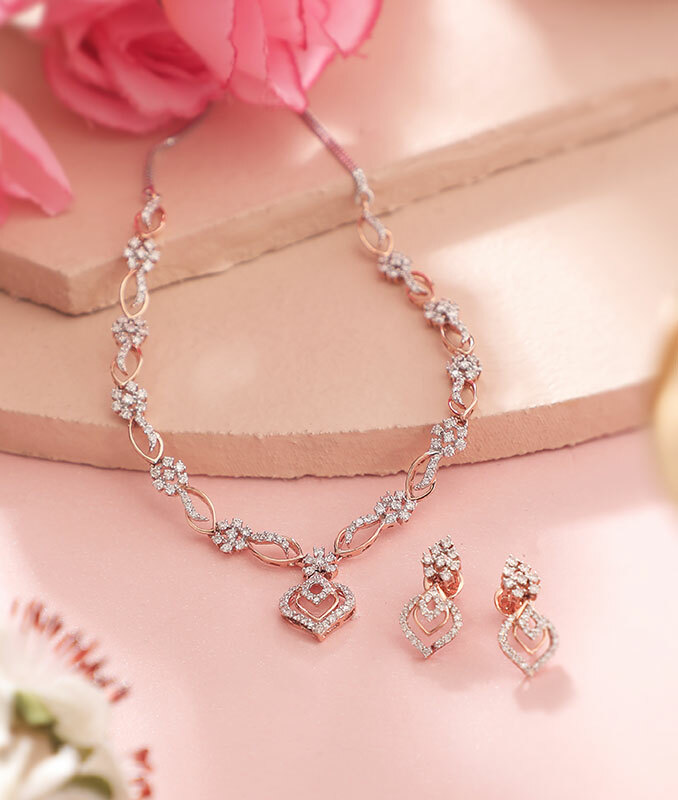 Centred with petal like motifs of 18K rose gold and round diamonds, the necklace set is completed with matching earrings. 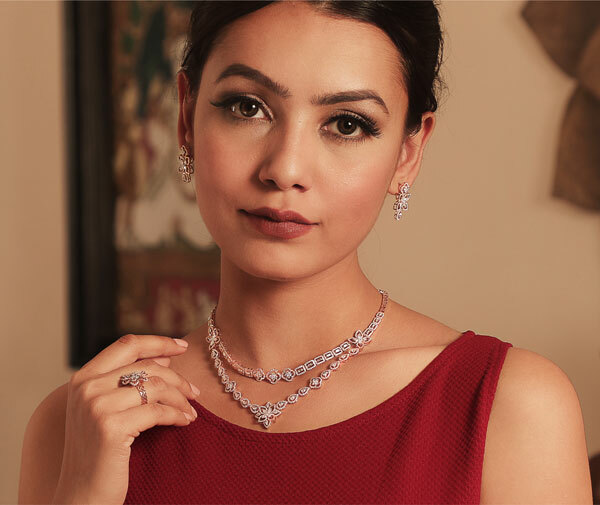 Dainty and marvellous, this diamond necklace has been crafted by intricately arranging floral motifs with 3.20 carat round shimmering diamonds to give it a pleasant look. Crafted in 18K white gold and VS GH diamond quality, transform your entire look with this splendid diamond necklace by Manubhai Jewellers. A diamond flower that leaves a trail of pearls, this pretty diamond bracelet in 18K dual toned gold will take your elegance to a next level. 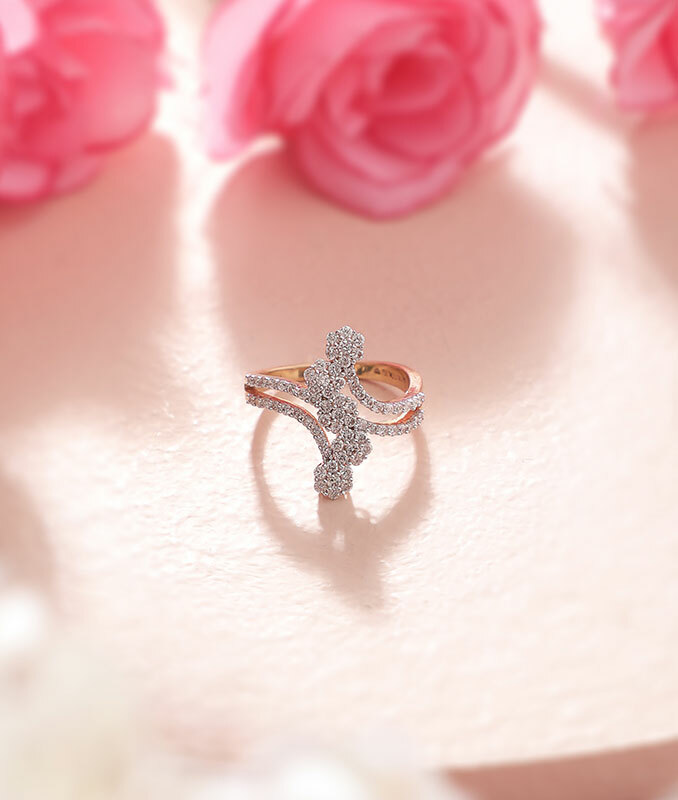 The perfect blend of matte rose gold with white gold flowers in sparkling round diamonds makes it absolutely unique. Crafted in 18k hallmarked yellow gold with VVS EF diamond quality, this classic floral diamond bracelet is the perfect easy yet stylish look. We just love how the floral motif is embedded in between two paisley designs. 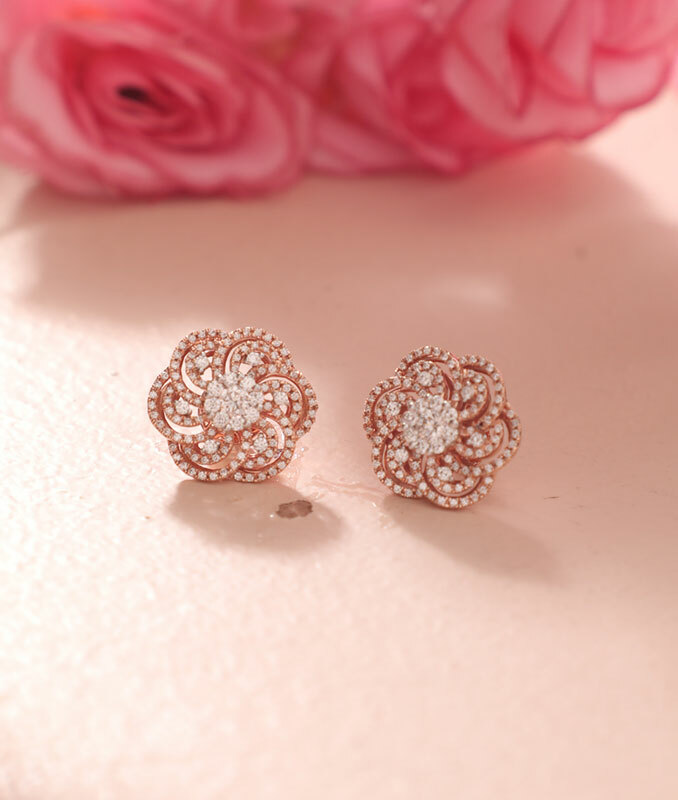 Floral Diamond Studs are a must have in every girl’s jewellery box. The 0.83 cents cluster of diamonds on the centre of this 18k hallmarked rose gold stud earrings gives a solitaire look. Wear it for your formal as well as daily occasions and look stunning. 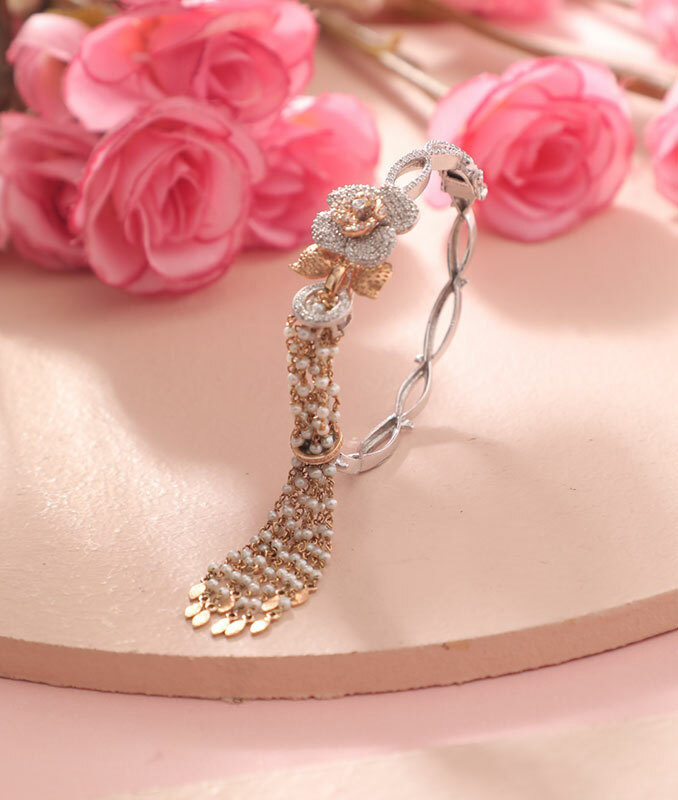 Garden Flower Diamond Bracelet in 18K Rose Gold. Bringing you closer to nature with our floral bloom 18k hallmarked diamond cuff of VVS EF quality. 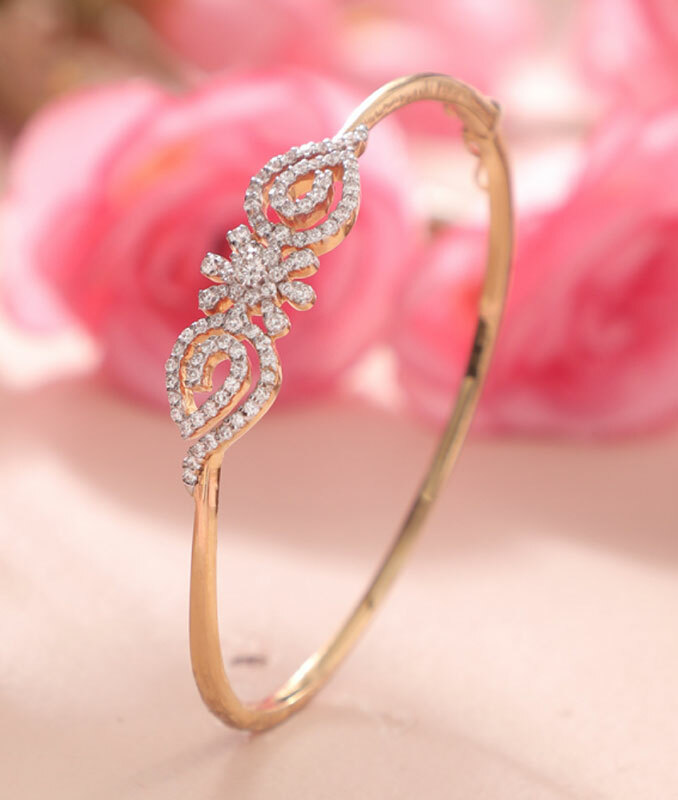 Modern and sleek this dainty floral design embedded with 0.83 cents diamonds can be flaunted on various occasions. 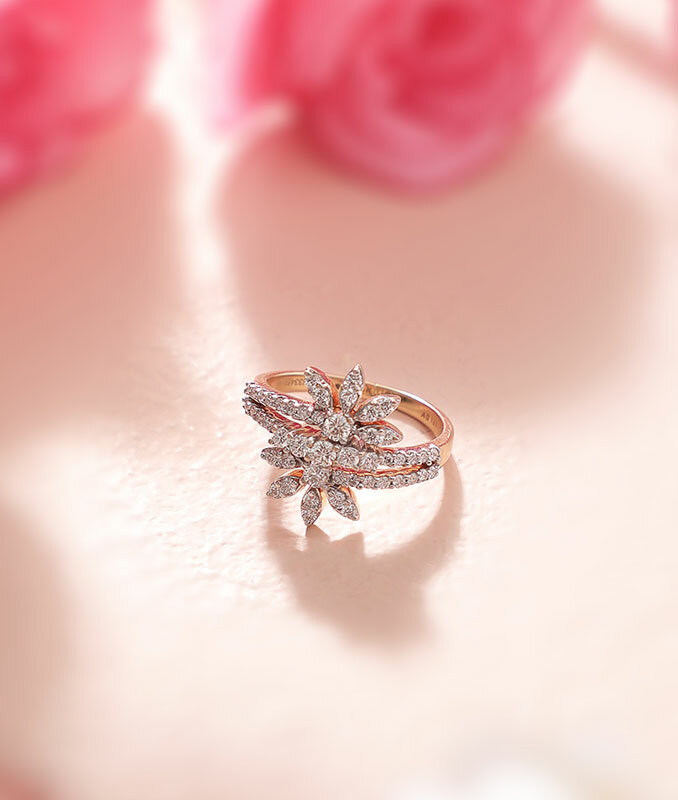 Rows and Rows of diamonds come meet the shining diamond flower in this stylish diamond ring. 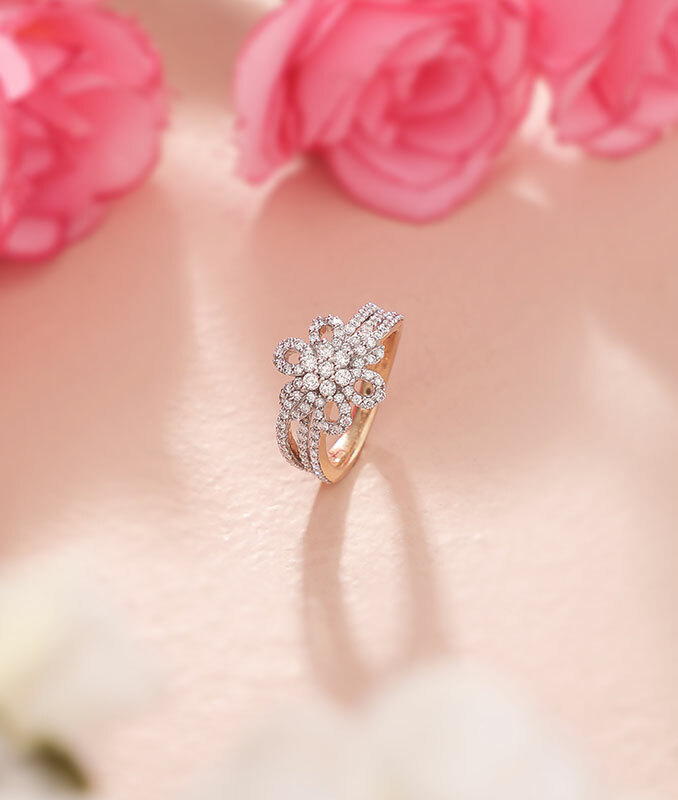 Crafted in 18K rose gold with VVS EF diamond quality and 0.83 cents diamonds, this arrangement of sparkling round diamonds in a floral motif can truly steal hearts. Shimmering round diamonds of VVS FG diamond quality are strung together in a floral design to give you a contemporary look. With 0.46cents diamonds studded in 18k hallmarked gold, this pretty diamond ring feels like flower power on your fingers! 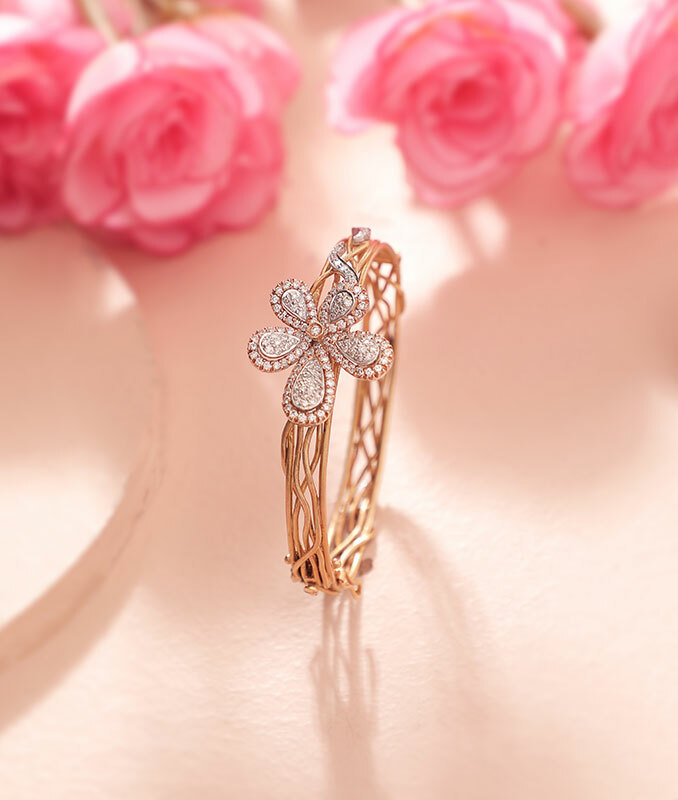 Two beautiful diamond studded flowers come together in a ring to give you a dainty look. Gift her this 18k rose gold unity of flowers diamond ring studded with 0.66 cent round diamonds in VS GH quality. Classy Circular Diamond Studs for that perfect evening! Some evenings call for diamond class! 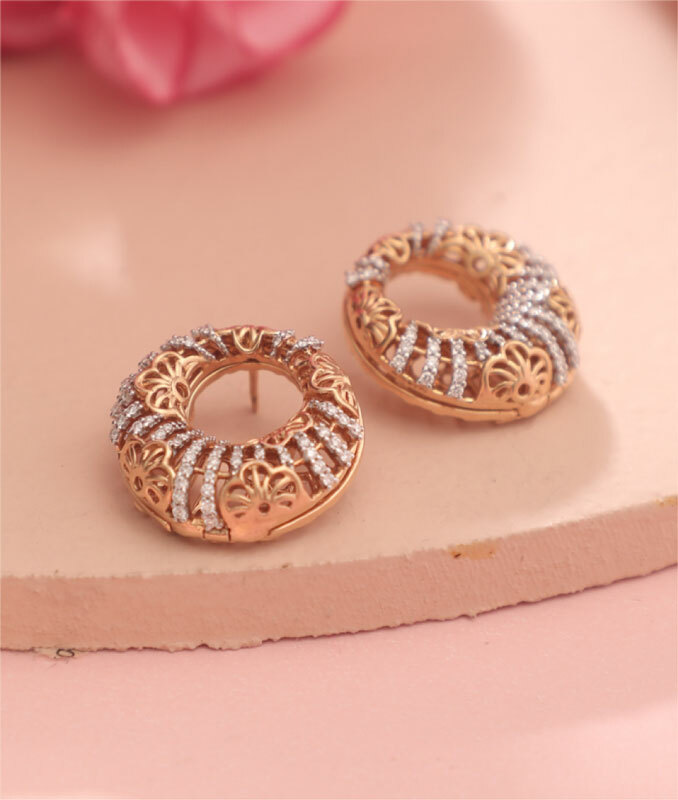 And we bring you just that in these pretty 18K rose gold floral cut and diamond weave stud earrings! With 0.57 cents diamonds and VVS FG diamond quality, we think it is the ideal flower to match your evening gown!